Hamburg, N.Y. - The Lake Erie Seaway Trail Center, 4968 Lake Shore Road Route 5, Hamburg, NY, will host the Great Shipwrecks of NY&apos;s Great Lakes Traveling Exhibit. The exhibit will be open from 10am to 4pm on Fridays, Saturdays and Sundays starting October 30, 2015 and will run through January 2016. 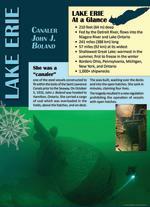 In a special presentation on Thursday, October 29 at 7pm at the Lake Erie Seaway Trail Center, New York Sea Grant Recreation and Tourism Specialist and Great Lakes Research Consortium Associate Director Dave White will open the exhibit with a program on The Future of NY&apos;s Maritime History: Dive the Great Lake Seaway Trail, the NYS Underwater Blueway Trail, and the National Marine Sanctuary Program. Orange County, N.Y. - Orange County, N.Y. is home to some of the scariest Halloween attractions in America. Historically, tens of thousands of people from as far away as Philadelphia, Boston and Connecticut make the trip to these Hudson Valley haunts to be horrified. This year, old favorites are promising a more extreme experience than ever, and a new scare park is making its inaugural debut. "Some of the most frightening Halloween attractions in the nation are right here in Orange County, NY," said Orange County Tourism Director Susan Hawvermale. "Our scare parks and haunted farms are not for the faint of heart, but blood-curdling excitement is just what thrill seekers are longing for this time of the year." GREENE COUNTY, NY (October 19, 2015) - In the Catskills, snow-capped mountains offer family and adventure-friendly activities all winter long. Find adventure on the hill at two ski resorts, or off in the Catskill Park, offering snowshoeing, and Nordic skiing a stone&apos;s throw from the best après ski party spots north of New York City.